Childrens Christmas Service - "Wonder of it All"
Luke 1:35 sets the theme of this childrens Christmas service, “The Holy One to be born will be called the Son of God.” The theme is simple: it’s about babies! How many times don’t our eyes focus on the manger Babe during this season? This service expands on that theme and begins with a number of Bible characters telling us about miraculous births and infancies. We meet Moses, Sarah, Hannah, and Zechariah as we take a careful look at several births mentioned in the Scripture. 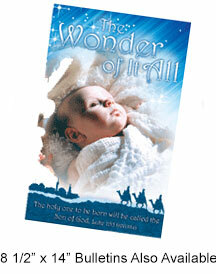 Finally we focus on the most miraculous birth of all, the incarnation of Jesus Christ. There in the manger on the first Christmas night we truly behold the wonder of it all. And to make that wonder even more precious to our hearts, we discover that the Baby in Bethlehem’s manger was intended for us, sinful creatures in need of God’s grace and mercy. SONGS – Five children’s songs with sheet music. There is also a spoken Christmas Prayer spoken during Silent Night.